Clarence “Cap” Cornish was an Indiana pilot whose life spanned all but five years of the Century of Flight. Born in Canada in 1898, Cornish grew up in Fort Wayne, Indiana. He began flying at the age of nineteen, piloting a “Jenny” aircraft during World War I, and continued to fly for the next seventy-eight years. In 1995, at the age of ninety-seven, he was recognized by Guinness World Records as the world’s oldest actively flying pilot. The mid-1920s to the mid-1950s were Cornish’s most active years in aviation. During that period, sod runways gave way to asphalt and concrete; navigation evolved from the iron rail compass to radar; runways that once had been outlined at night with cans of oil topped off with flaming gasoline now shimmered with multicolored electric lights; instead of being crammed next to mailbags in open-air cockpits, passengers sat comfortably in streamlined, pressurized cabins. In the early phase of that era, Cornish performed aerobatics and won air races. He went on to run a full-service flying business, served as chief pilot for the Fort Wayne News-Sentinel, managed the city’s municipal airport, helped monitor and maintain safe skies above the continental United States during World War II, and directed Indiana’s first Aeronautics Commission. 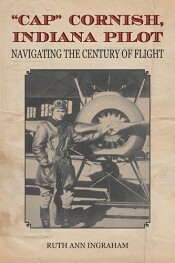 Dedicating his life to flight and its many ramifications, Cornish helped guide the sensible development of aviation as it grew from infancy to maturity. Through his many personal experiences, the story of flight nationally is played out. · Who’s Who in Transportation and Communication in 1942. · Father of Fort Wayne Aviation by OX5 Aviation Pioneers, Indiana Wing, May 24, 1975. · Commendation by Art Smith Aeroplane Society in 1978. · Inductee, OX5 Hall of Fame, San Diego, September 1986. · Recognition as a pioneer in the development of aviation as a means of transportation by the Indianapolis Aero Club at a banquet in his honor held the same day. · Three times Sagamore of the Wabash—1978, 1988 and 1992. · Honored Founder Member at the 1993 banquet of the Order of Daedalians,* Air Force Museum, Wright Patterson AFB, Dayton. · Indiana Aviation Person of the Year by the Aviation Association of Indiana in 1994. · World’s Oldest Actively Flying Pilot, Guinness World Records, 1997–2003. * The Order of Daedalians honors, as its Founder Members, all WW I aviators who were commissioned as officers and rated as military pilots no later than the Armistice on 11 November 1918. It perpetuates their names as the first to fly our country's airplanes in time of war. Ruth Ann Ingraham, born in Fort Wayne, Indiana, has a BS degree in French and political science from Purdue University. A naturalist and native plant advocate, she is the author of the memoir Swimming with Frogs: Life in the Brown County Hills (Indiana University Press, 2005), which interweaves observations of nature with reflections on life and love. She is cofounder of the Indiana Native Plant and Wildflower Society and the Brown County Native Woodlands Project, and she is involved in the Indianapolis Woman’s Club, a literary organization founded in 1875, in which active members biannually write and read papers on topics of their choosing.